The five oceans of the world make up about 70 percent of the Earth's surface. Inside these giant bodies of water you can find all kinds of cool creatures, wild storms, and pollution problems. The more you know about the oceans, the more you can help keep them safe and vibrant. 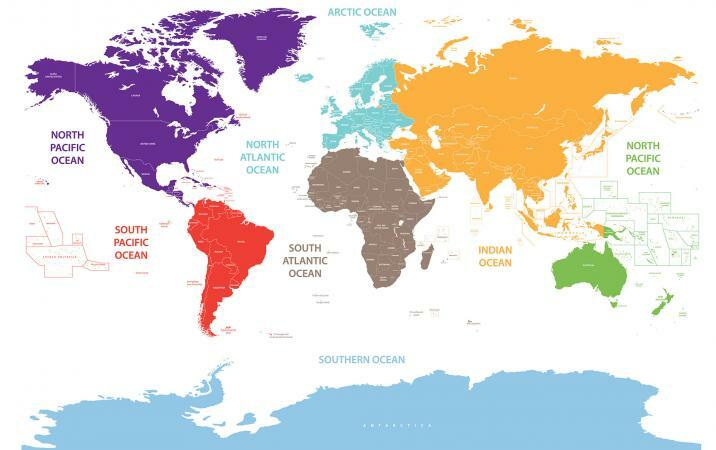 Although there are five distinct oceans across the world, they are all connected by smaller waterways like seas, tributaries, and rivers. The Puerto Rico Trench is the deepest part of the Atlantic Ocean. The Southern Ocean wasn't an official ocean until the year 2000. When an iceberg cracks and breaks away from an Antarctic glacier, it makes a large noise called an icequake. A hydrophone is like a microphone for underwater sounds. The official language of the seas is called Seaspeak. Each ocean is different in size, particularly measurements like how deep it usually is and how much land it touches. The Pacific Ocean is the largest while the Arctic Ocean is the smallest. Altogether, the world's oceans cover over 360 million square kilometers of the Earth's surface. The Pacific Ocean is more than three times as deep as the Arctic Ocean. The Southern Ocean is also called the Antarctica Ocean. 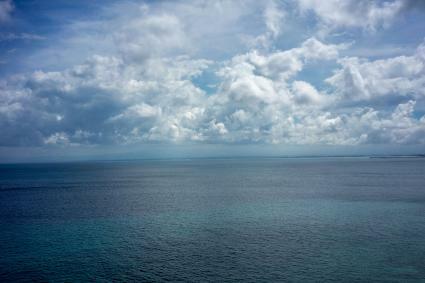 As the largest ocean, the Pacific equals about half of all the water surface on Earth. The equator separates the Atlantic Ocean into two parts, North and South. The Atlantic Ocean coastline is nearly twice as long as the Indian Ocean coastline. 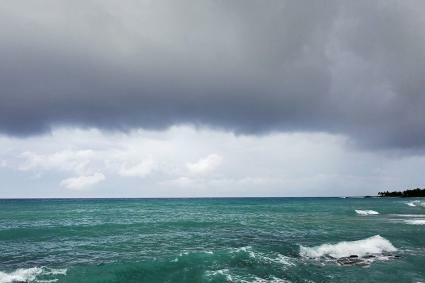 Organizations such as the National Oceanic and Atmospheric Administration and Natural Resources Defense Council focus on understanding the way ocean and the life within them works. Using this information they can see how pollution affects marine plants, marine animals, and humans. Garbage and other pollution debris collects in the center of Ocean gyres, making floating piles of junk. The largest oil spill in modern history was the 2010 Deepwater Horizon well blowout which leaked over 160 million gallons of oil into the Gulf of Mexico. Sound waves travel faster and farther in water than they do in air. Human sounds filling up the oceans are known as noise pollution and harm animals like whales and dolphins. Storms that take place in or over an ocean, like a tsunami or cyclone, can be dangerous for ocean and human life. The more people understand about these storms, the better prepared they can be to prevent damage from them. Hurricanes get their names from one of six master lists of male and female names. The names of the most destructive hurricanes are retired from the naming list so they can never be used again. Hurricanes take heat away from the equator toward the poles to help keep the Earth's temperature stable. In 2004, the deadliest tsunami ever hit Indonesia and affected people in fifteen countries. Like life on land, ocean life involves a lot of plants and animals working together to create a stable place to live. Over 1,000 species of living things call the oceans home. Marine plants and algae provide nearly 80 percent of the Earth's oxygen. There are over 50 species of seahorses living in the oceans. Some marine animals, like sea turtles and hammerhead sharks, have existed for millions of years. Books, movies, television shows, and field trips can give you lots more information about the oceans. Discover more fun facts about the ocean when you watch the "Ocean Explorers" episode of Wild Kratts. If you can't get to a real ocean, stop by a local aquarium to meet marine animals and learn from ocean experts. For kids in grades one to five, The Magic School Bus on the Ocean Floor by Joanna Cole and Bruce Degen shares ocean facts through a fun adventure with Miss Frizzle and her class. Having a marine mentality, or thinking about oceans frequently, helps you become a better global citizen. The world's oceans are an important part of your everyday life and now you can understand how.